It is with sadness our family announces the passing of Lillian Pheasey on November 27, 2015 while in the Royal Alexandra Hospital Palliative Care unit. Lillian was born in Saskatoon, Saskatchewan on February 23, 1923 eldest daughter of George and Lillian Jackson, and sister to Margaret and George. 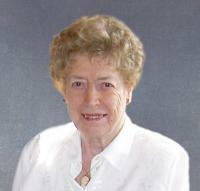 Lillian grew up in Edmonton and began her first teaching position in the Orbindale district north of Irma, Alberta. Lillian met and married her husband of 54 years, Arthur Pheasey in 1944. They moved to the family farm in the Saltaux district and had two children. Amber Gray was born in 1947 and George in 1948. In 1961 they moved to Mannville, Alberta where they resided until Arthur’s passing in 1999. Lillian moved to Edmonton in 2002 and resided in the Boardwalk Retirement Community until her passing. Lillian was predeceased by her husband, Arthur on March 22, 1999; by her sister, Margaret in 1978; by her mother in 1975 and her father in 2002; by her brother-in-law, Bernie in 2002; and by her granddaughter, Suzanne in 2015. We are sad but celebrate her life: daughter, Amber Gray; son and daughter-in-law, George and Andrea Pheasey; oldest grandson, Tom Pheasey and Heather and their children Annika, Liam and Sophia; and youngest grandson, Alex Pheasey and Shannon and their children Jackson, Simon and Eleanor. Lillian leaves many friends including many special friends in Edmonton, Mannville and Vermilion. A Memorial Service will be held at 11:00 a.m. on Friday, December 4, 2015 at St. Mary’s Anglican Church, 11203 - 68 Street, Edmonton, Alberta. Cremation has taken place and interment beside her husband Arthur will take place in the Mannville Cemetery in the spring of 2016. While Mom loved flowers, she requested that in lieu of flowers, donations be made to: Children’s Cancer Unit at the Stollery Children Hospital or the Yona Music Group at the Winspear. Other considerations would be the Hope Mission or a charity of your choice.